CHA Family Medicine Residency | Tufts family medicine residents have "the best of both worlds"
Tufts family medicine residents have "the best of both worlds"
This is kind of old news, but FDA is coming down harder on codeine-containing meds, especially in kids and adolescents. Includes similar conclusions by European Medicines Agency. A lot of information in this document, including some good graphics on pharmacology and why codeine can be so dangerous. I would broaden that to “all humans”. Probably other species as well. Really just no good indication for codeine for anything. Any combination drug with a “C” or “AC” after it could contain codeine. Also, of course, “Tylenol #3”. I still see a lot of Cheratussin AC out there, sadly sometimes prescribed by Malden providers. Let’s just not use this stuff at all. Especially if you see a child who has been prescribed it by some ED or urgent care. Tell them to throw it out. Categories: Uncategorized | Tags: children, Pharm | Permalink. The plot thickens. I can’t imagine how difficult it must have been to try to cram all that stuff into a 3-4 month old! The four we had would have spit out at least 75%. I compute the NNT to be around 66 overall, and 20 in the “per protocol” analysis. – even though the P value was high (need to figure out how to reduce unnecessary variance in babies!). Bottom line for me is that it’s ok to ask babies if they want to try some interesting foods, starting at around 4 months of age, including those who might be at high risk for food allergy. Most of the stuff on the web, powered by AAP and USDA, says start introduction of solids between 4 and 6 months. WIC starts handing out baby food at 6 months, but they ok introducing solids between 4 and 6 months. Unclear whether these recent studies are going to change those eminence-based recommendations. Categories: Uncategorized | Tags: children, Patient Education | Permalink. FDA: Quinolones are mo’ bad. Avoid antibiotics in general. Right? Nitrofurantoin seems generally ok for UTI, but some elders weird-out on that as well. Macrolides can kill you. Suddenly. Rarely. Especially azithro. QTc and whatnot. Amoxicillin, cephalosporins of course are options. Doxycycline is sometimes forgotten as an option for respiratory/cutaneous/GI/GU infections. Don’t go in the sun. SXT-TMP (Bactrim) – effective for a lot of infections, but E coli often resistant. Categories: Uncategorized | Tags: antibiotics, Pharm | Permalink. 1. Thou shalt have no aim except to help patients, according to the goals they wish to achieve. 2. Thou shalt always seek knowledge of the benefits, harms, and costs of treatment, and share this knowledge at all times. 3. Thou shalt, if all else fails or if the evidence is lacking, happily consider watchful waiting as an appropriate course of action. 4. Thou shalt honour balanced sources of knowledge, but thou shalt keep thyself from all who may seek to deceive thee. 5. Thou shalt treat according to level of risk and not to level of risk factor. 6. Thou shalt not bow down to treatment targets designed by committees, for these are but graven images. 7. Honour thy older patients, for although they often have the highest risk, they may also have the highest risk of harm from treatment. 8. Thou shalt stop any treatment that is not of clear benefit and regularly reassess the need for all treatments and tests. 9. Thou shalt diligently try to find the best treatment for the individual, because different treatments work for different people. 10. Thou shalt seek to use as few drugs as possible. 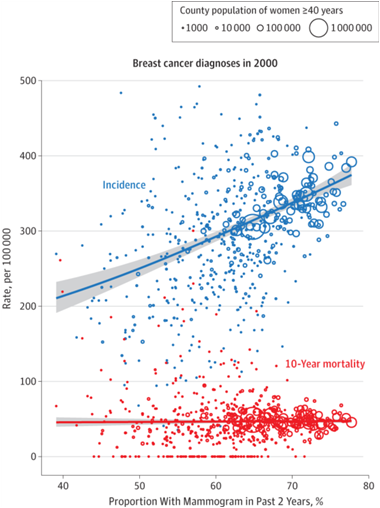 A classic overdiagnosis curve, showing a dramatic increase in breast cancer diagnosis, as related to proportion of women getting mammograms, without a commensurate change in 10 year mortality. If we can’t stop the mammography juggernaut, we should at least inform our patients of the risks of overdiagnosis. Categories: Uncategorized | Tags: breast cancer, breast cancer diagnosis, cancer screening, health maintenance, Overdiagnosis | Permalink. 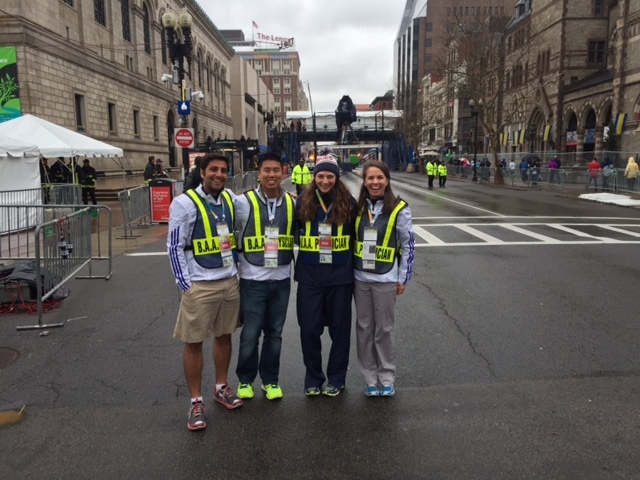 On Patriot’s Day several of our teaching faculty volunteered for the Boston Marathon with current and former residents. Former resident Nathan Cardoos is currently at UMass doing a sports medicine fellowship and current PGY2 resident Sam Hwu is applying for sports medicine fellowship. 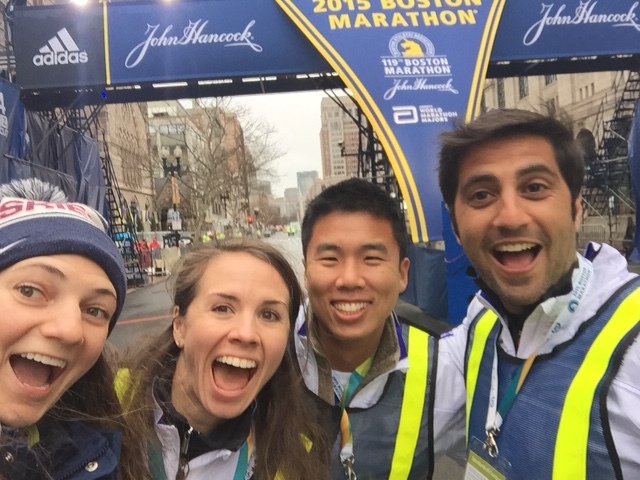 Jess Knapp is our new sports medicine faculty member from UConn and this was her second year volunteering at the marathon. Nicole O’Connor recently graduated from our family medicine residency and was scooped up to stay on as faculty. This is Nicole’s 3rd year as a volunteer and she ran the marathon in 2011 as well! Our tent was busier than in years past and at one point we reached max capacity and runners were diverted to other finish line tents. Most of the runners were seen for hypothermia due to the running conditions and improved with warm blankets and warm drink. Overall we had fun listening to the stories told by runners and volunteers while patching up our nations athletes. Categories: Malden Family Medicine Center, Residency Updates | Tags: Sports Medicine | Permalink. On Wednesday afternoon, April 15 the Tufts University Family Medicine Residency at Cambridge Health Alliance had a fantastic field trip to the Massachusetts State House for the Annual Massachusetts Academy of Family Physician’s Advocacy Day. We had a group of PGY-2 and 3 residents along with 3 faculty attend the event. This great annual event that is one of our key activities to get residents training, exposure and practice with direct face-to-face political advocacy with their state legislators, and for many participants, this was their first trip to a state house to interact with legislators and their staff. In preparation for the day, residents completed the Society of Teachers of Family Medicine on-line advocacy course which gives a great orientation to political advocacy. The afternoon then started with an orientation from the Mass AFP’s lobbying team who gave a legislative Overview, as well as Policy and Advocacy briefing and they also “armed us” with some “one-pagers” describing some of the talking and position points that we could share in our legislative meetings. After this coaching we broke up into small teams of constituents to go visit the offices of our Senators and Representatives. We had many great conversations with staffers and legislators sharing some of our “real life doctoring stories” to illustrate how policies and the current healthcare climate effect our day to day practice and our patients. Massachusetts (now down to 1.8% of our population being uninsured after passing universal coverage in 2007) is ahead of the rest of the nation in closing the gaps of care. Our state also points to “next step” challenges; once near universal-coverage has been obtained, the primary care shortage gets amplified when patients finally have coverage – they want to use it! We’re also in the throes of figuring out how shifts to “value based payment” models replacing the disincentives of our traditional fee-for-servcies are requiring us to proactively create teams that can produce health and wellness, not just just respond to disease. Many of our conversations that day were around Chapter 224, “An Act Improving The Quality Of Health Care And Reducing Costs Through Increased Transparency, Efficiency And Innovation” passed in 2012. Though not yet fully enacted, this act establishes a Health Planning Council and an independent Health Policy Commission that monitor the supply and demand of health resources and supervises and monitor transitions to Accountable Care Organizations. Pipeline and residency funding streams for primary care loan repayment programs and funding for primary care residencies are also part of this legislation. Massachusetts has passed some great legislation that will help move our health system in good directions – but there is clearly much to be figured out in the details. For those in our program new to political advocacy the Family Medicine Advocacy Day provided a thrill in learning how to make their voices heard, and that we can serve as valuable resources to our legislators who are trying to make difficult decisions to direct our government in responsible ways. Our day at the capitol fell on the heels of a major political win for family medicine nationally when earlier in the week the US Congress passed the Medicare Access and CHIP Reauthorization Act of 2015 (HR 2), which repealed SGR and extended several key programs of importance to family medicine. It was a great week for political advocacy at TuftsFMR@CHA!! Categories: Residency Updates, Systems-Based Practice | Tags: Advocacy | Permalink. Raj Mehta on How many women have HPV? CHA Malden Family Medicine Center Our expert Family Medicine team sees people of all ages. You will find a one stop approach to your health needs. This includes primary care as well as special services like Women’s Health, Acupuncture and Integrative Medicine. TUFMR MyHQ Weblinks Here is a collection of links that our Family Medicine faculty and residents find useful for teaching and patient care. Tufts/CHA Family Medicine Residency CHA & Tufts share the belief that FM training requires a strong community experience. Tufts FM residents learn a lot by teaching and our faculty possesses creativity, energy, and a strong commitment to resident education.